Matah مجموعه ای از پوسته های آماده با طراحی بسیار زیبا و ریسپانسیو جهت استفاده در ایمیل های ارسالی و تبلیغاتی میباشد. شما در ایمیل های تبلیغاتی , خبرنامه ای , انتخاباتی , معرفی محصولات و… خود میتوانید از این مجموعه قالب آماده بسیار زیبا و حرفه ای استفاده کنید و ظاهری بسیار زیباتر به ایمیل های خود ببخشید. این قالب ها کاملا قابلیت ویرایش و تغییر را دارن پس میتوانید طبق سلیقه خود آنها را تغییر دهید. 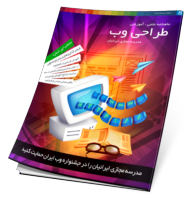 این مجموعه قالب آماده کاملا واکنش گرا میباشند یعنی در موبایل و تبلت به اندازه صفحه نمایش کاربر در خواهند آمد. 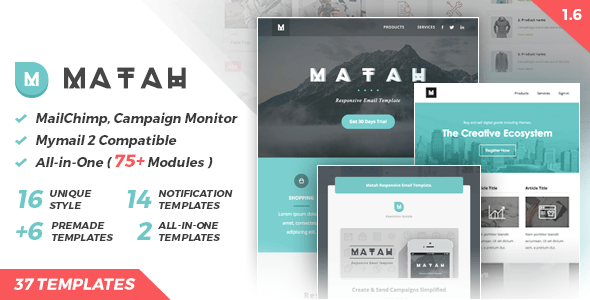 Matah v1.6 Themefores Premium Responsive Newsletters Email Set Templates For Marketing. This Email Template was styled easy to realign edit content customize color or even sending your campaign directly from the builder. Matah v1.6 Responsive Newsletters Email Set Template features: Template Builder by StampReady, Commented HTML, Compatible with FreshMail, Flexible table structure (delete/copy/replace), Responsive for your mobile device, Test sending directly at the demo page, Full Cover, Menu Bar header style, Conversion Centered Design, All-in-one template for easy remix layout from various template(in the set), 36 Unique template with 6 Main premade template, Advanced lossy compression for PNG,JPG (reduce png,jpg file size -70%), Compatible with awesome WordPress plunin MyMail, StampReady an Export file usable with MC, CM.